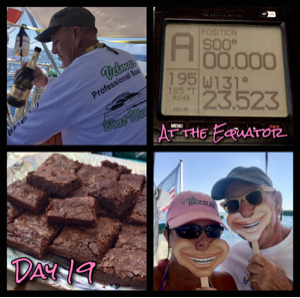 4.13.18 @ 1700 Zulu Day #19 Latitude: 00°00 (At then Equator!) Longitude: 131°23 W Covered Distance Last 24 Hours: 132 NM Distance to the Marquesas: 738 NM Distance from Punta de Mita, Mexico: 2260 NM Weather: Sunny with 10% Clouds Winds: E 14 Knots Sea State: ESE 4’ Sea Temp: 80° Air Temp: 84° Course: 220° Speed: 5 Knots Barometer: 1012 Crew’s Mood: Excited, Exuberant and Celebratory! Happy Friday the 13th! It’s another spectacular morning for night watch out here. The sky is so clear the stars look close enough that I could reach up and grab one. The Milky Way is perfectly visible with its white path emblazoned upon the sky. God I love this time of day! I can honestly say I’ve come to adore the gallows man for waking me each day so I can relish in the beauty of this time. As of late the lazy moon does not begin to poke his head above the horizon until around 0330 local time. He must be out carousing with Orion in the Milky Way at night these days as he is reporting for duty much later than normal. Or, perhaps it’s because he is in his final phase of this cycle and he’s just plain tired. I can certainly understand that as I went for two nights with little sleep. Now that we are south of the ITCZ we are healed to the starboard side. This makes for rather uncomfortable sleeping in the berth, at least for me. Add that my dear, sweet honey spends his watch texting with others in the fleet all night and the constant beeping of texts going in and out is enough to prevent anyone from getting any shut eye. It’s okay though. Now that he knows he’s been keeping me awake he’s turned the sound off. He says he’s doing it for me but I really think it’s because he’s afraid of Queen Medusa when she comes grumbling out of the cabin in the morning. I can’t say I blame him. It’s not a pretty sight even when she’s happy but when she tired the snakes start hissing and swirling about her head. Oh yeah…not a good thing. Fortunately I finally got a good, long sleep last night and am feeling much better on watch tonight. I’m so enjoying the beauty of the sky and the sound of the sea as Dazzler makes her dramatic plunges into the swells. Yes, she’s a bit of a drama queen but it is a beautiful thing to see and hear. With each crash the phosphorescence comes bubbling to the surface and darts away from us. Even in a moonless sky the glow is so bright it is almost magical. As I come on watch at 0015 local time we are but 39 miles from the equator. It so exciting I feel like a kid on Christmas morning. Grape Ape has been dancing on deck all evening. He’s got his I Love San Diego t-shirt on, has the binoculars out and is searching for that line in the water. Falcor is flying overhead trying to assist Grape Ape in his search and Wilson is on deck helping them to look in the right direction. You, know, with his military background he is a whiz at navigation. Yes, the mood on board is truly electric. Dan even got in the galley and made brownies yesterday for us to enjoy during our Shellback ceremony. Ghiradeli ones too! Oh yeah! We will meet the equator sometime after sunrise. Our plan is to hove to and enjoy the moment with brownies and champagne! Yep…breakfast of champions! The thought of finally reaching the equator has made me spend considerable time contemplating the events that lead me to this very day. Was it chance, luck or destiny? I mean think of it. What are the odds that a southern girl from Florida would find a sailor living on his boat in México, meet him, date long distance for almost two years, fall in love with him and then end up living on his sailboat and sailing the world with him? Just think of all the things that had to perfectly fall into place for all that to happen. Prior to retiring one of the things I did was create systems to streamline processes in the law firm for which I worked. I would create flowcharts listing each and every task associated with a specific process. Sometimes the charts, printed out, would be over 15 feet long. I just can’t imagine how long the one would be that mapped out how I got to be here today. All that said, I personally believe we were destined to find each other and God’s flowchart to get us here is so long there isn’t enough paper in the world to print it. I wake each day and thank God for bringing us together. At 1839 Zulu we arrived at the equator. Yep, Grape Ape, Falcor and Wilson found the line in the ocean. Our toilets started swirling in reverse and everything seemed to shift. We all officially went from Pollywogs to Shellbacks. That’s a nautical term for someone who crosses the equator via boat for the first time. The navy has a full ceremony they perform for those on ships crossing for the first time. We shared a bottle of champagne given to us by our dear friend, Horacio Vel from La Cruz. Dan said a few words and I scattered some of my daddy’s ashes. We also offered up a gift of a brownie and some champagne to King Neptune to continue to honor us with his favor along our journey. Dan jumped in the water for a few moments and cleaned some gooseneck barnacles from the stern of the boat. I chose to stay aboard. It wasn’t a real fancy ceremony by any stretch but it certainly suited this rag tag team of sailors. So far this journey has been a blessed one for us. We’ve had few issues and those we’ve had were relatively minor in comparison to those of others in the fleet. Our weather has been fantastic! We encountered less than a handful of squalls in the ITCZ and were able to spend a good portion of our time there sailing. An interesting thing we noted is how the water in the ITCZ was no longer the icy blue we’ve become accustomed to seeing. It was still very clear but it turned a more aqua green color. A color I’m more used to seeing in the Gulf of Mexico. Now that we are on the southern side it’s back to blue again. We’re enjoying watching the subtle changes in wind, water color, temperatures, currents etc… Mother Nature is truly awesome! Shellback ceremony complete and we are on the home stretch with just another 738 NM to our destination at Hiva Oa! Wooooohooo! Won’t be long now. I’ve got my money on 26 days and the under. That would put us there a week from today, April 20th but I’m sensing it may even be on Thursday the 19th. Dan originally said, “28 days”. We’ll see who is right. Spoiler alert..it will be me!